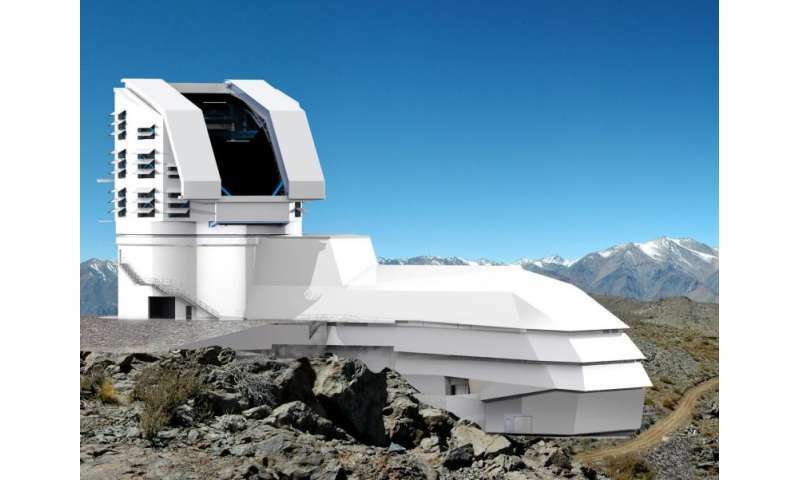 At a traditional stone-laying ceremony outside La Serena, Chile on April 14th, construction officially began of the Large Synoptic Survey Telescope (LSST). This ambitious international astrophysics project is slated to start scanning the heavens in 2022. When it does, LSST should open up the "dark universe" of dark matter and dark energy—the unseen substance and force, respectively, composing 95 percent of the universe's mass and energy—as never before. On April 2, 2015, the Director of LSST, Steven Kahn, along with astrophysicist Sarah Bridle and theoretical physicist Hitoshi Murayama, spoke with The Kavli Foundation about how LSST's sweeping search for dark matter and dark energy will answer fundamental questions about our universe's make-up. In the process, LSST will help answer vexing questions about the universe's history and possibly reveal its ultimate fate. "In terms of how much light it will collect and its field of view, LSST is about ten times bigger than any other survey telescope either planned or existing," said Kahn, the Cassius Lamb Kirk Professor in the Natural Sciences in the Kavli Institute for Particle Astrophysics and Cosmology of Physics (KIPAC) at Stanford University. LSST will feature an 8.4-meter diameter mirror and a 3.2 gigapixel camera, the biggest digital camera ever built. Every few days, the telescope will survey the entire Southern Hemisphere's sky, hauling in 30 terabytes of data nightly. After just its first month of operations, LSST's camera will have observed more of the universe than all previous astronomical surveys combined. This capability to rake in data, extended over a ten-year observing run, will yield a staggering amount of astronomical information. The telescope should observe some 20 billion galaxies and many tens of thousands of supernovae. In addition, LSST will help map the stars composing the Milky Way and spy reams of asteroids passing near Earth. The galaxy and supernova observations, along with other data, will offer some of the most stringent tests of dark matter and dark energy ever conducted. Solving the riddle of dark energy will not only deepen our understanding of our universe's past, but also sketch out its future. Murayama continued: "To understand these questions, it's like trying to understand how quickly the population of a given country is aging. You can't understand the trend of where the country is going just by looking at a small number of people. You have to do a census of the entire population. In a similar way, you need to really look at a vast amount of galaxies so you can understand the trend of where the universe is going. We are taking a cosmic census with LSST." To analyze this census, researchers will chiefly rely on a technique called gravitational lensing. Foreground galaxies and their associated dark matter gravitationally bend the light streaming from background galaxies in an observable, measureable way. Gauging this gravitational lensing distortion in LSST's vast image collection will speak to the strength of dark energy, which is accelerating the expansion of the history, at different times in cosmic history. "With the data, we're going to be able to make a three-dimensional map of the dark matter in the universe using gravitational lensing," said Bridle, a professor of astrophysics in the Extragalactic Astronomy and Cosmology research group of the Jodrell Bank Center for Astrophysics in the School of Physics and Astronomy at The University of Manchester. "Then we're going to use that to tell us about how the 'clumpiness' of the universe is changing with time, which is going to tell us about dark energy." "The clusters appear to be moving along a line extending from our solar system toward Centaurus/Hydra," Kashlinsky said." 'Empty' space has mass which is referred to as the 'dark mass'. Dark energy is dark mass continuously emitted into the Universal jet. Yup, and until you've had your velocity dispersed, you don't know nothin'.